During our visit to Florida we made a quickie visit to Pompano Beach Florida. This is a busy city and is located just north of Ft. Lauderdale. The nearby Hillsboro Inlet forms part of the Atlantic Intracoastal Waterway. 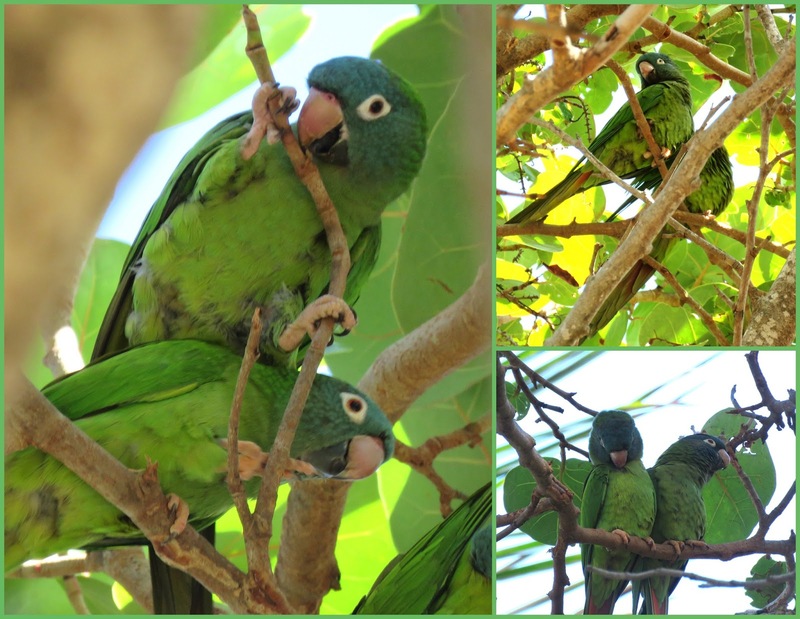 My main reasons or goal for visiting Pompano beach was to see the parakeets that were being seen near the beach and Pompano Pier and to see the Hillsboro Inlet Lighthouse. I was lucky to get a metered spot right in front of the beach and so lucky my parking spot was right in front of the tree were the Blue-crowned Parakeets were being seen. As soon as I got out of our car I could hear the noisy parakeets. There may have been 15-20 of the pretty parakeets in the one tree. These Blue-crowned parakeets are my newest lifer. 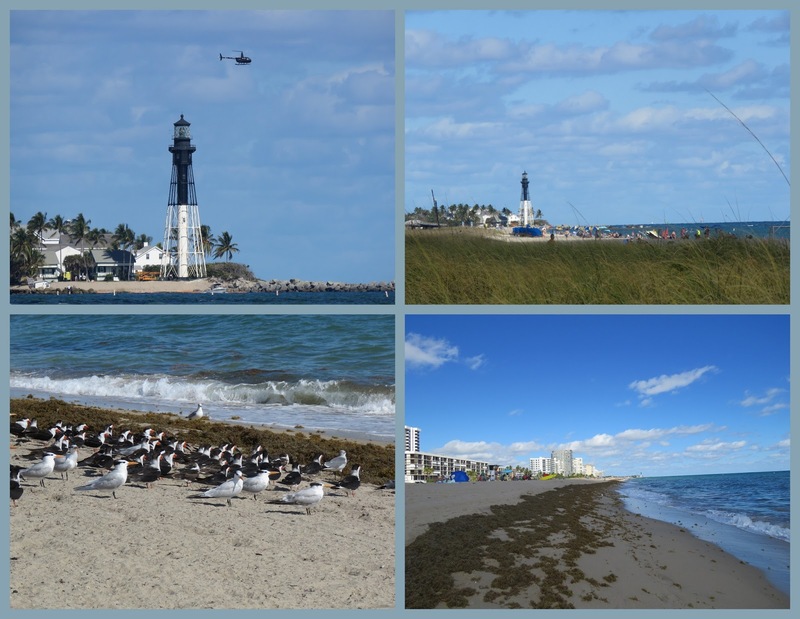 Photos in the mosaic, I was able to zoom in on the Hillsboro Inlet Lighthouse. Black Skimmer were on the Pompano Beach along with some pretty Terns. The beach and water had this ugly red seaweed, it did not look like the usual sea weed I am used to seeing. Below is my parakeet tree, the parakeets almost blended in with the green leaves. 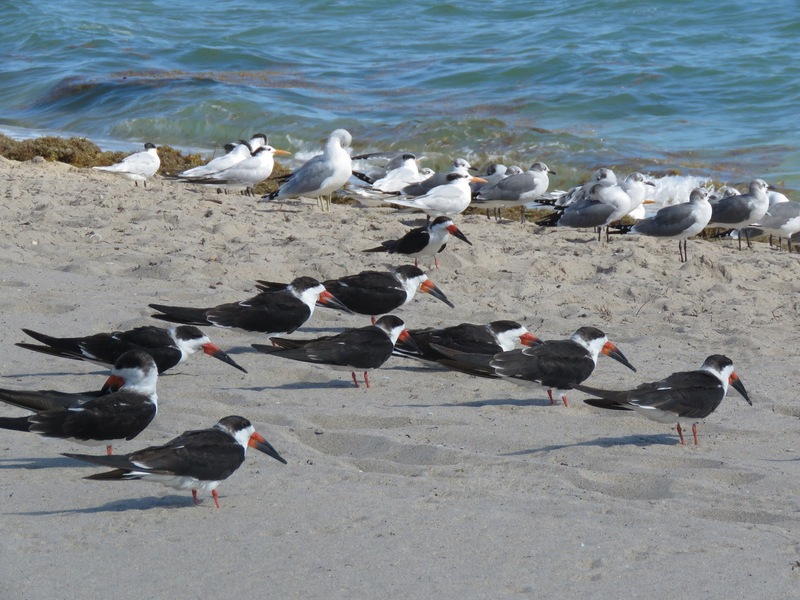 I didn't count them but there were maybe 30 or more Black Skimmers on the beach and with some Terns and Gulls. A closer look at the Hillsboro Inlet Lighthouse, there was a helicopter flying by when I took the photo from the Pompano beach. Lighthouse tours are offered only once a month and it includes a boat ride to the island where the lighthouse is located. Lindas aquelas primeiras aves, aproveito para desejar uma boa semana. Thanks for sharing views of this beautiful place. I like both Parakeets and Terns, but the Black Skimmers are amazing! Beautiful beach front and inlet shots despite the red seaweeds trying to let down the views! Parakeets are prettier and glad you got to see them as soon u parked. It is quite incredible the extent to which parrots are establishing themselves in areas where they have formed substantial populations and compete with native species for nest cavities etc. This is true right across Europe as well as in North America. I need to make it to the East Coast more often. Those parakeets must be thriving in FL. I saw a couple in St. Petersburg in the winter a few years ago. I dare say they go further south when it gets colder. Great capture of the pretty little guys. ...a beautiful spot to be! I love the Black Skimmers, looking at what????? Black skimmers are my favorite Florida marine bird. The royal terns crack me up. They look like little old men with their "bald" heads. How exciting to see the Parakeets! WOW! I've never seen those! And I love that beautiful lighthouse. I would love to travel around just to see lighthouses! Happy MM! I like the lighthouse, it's different from the ones I've seen. The parrots are pretty, I didn't know there were wild parrots out there. Pompano Beach looks like a wonderful place to visit. Glad you enjoyed it. Beautiful photos, Eileen and thanks for sharing. Have a wonderful day and new week. All great photos but those parakeets are my favorite. How great that you saw the parakeets, Eileen! Beautiful images from the beach. The lighthouse was great! Pretty parakeets too. Have a nice Monday, and the week ahead! Gracu ias Eileen, por estos fantásticos collages. Me encanta el del faro. You can not see the parrots on the tree, because they are green and you can hear them for sure, because they are flashy. Well, you saw the lantern that you wanted to see. There were interesting birds on the beach. Greetings. Those parakeets are quite pretty! At our first house, we were woken by a loudest racket ever. Outside our window was a tree completely filled with parakeet. Our neighbor told us that these amazing creatures migrate from our mountains near by every fall. It was truly incredible. Interesting looking lighthouse..see through..Love the parakeets..and their tree..Have a fun week..
That lighthouse is a beauty! Neat! love The parakeets. You’ve once again given me a place to add to my must visit list! Eileen - congratulations on adding a new bird to your lifer list. Can I assume from your comments that these parakeets are not a normal sighting at this beach? How did you hear about them in that location? The skimmer is a new bird for me - what large beaks they have! Love your mosaics - thanks for sprinkling some more of that Florida sunshine on Mosaic Monday! Those parakeets are beautiful! I opened the photo of the tree up in a whole new window to get the biggest version of the photo...I could not distinguish a single parakeet! That is amazing that they blend in that much! How cool is that, don't you love it when the bird you hope to see is just right there...I sure do. Awesome!! A great delight to find another lifer, they are really so beautiful. Lighthouses, they have played such an important part of anyone who is at sea, and I hope they will always be kept and maintained well. The lighthouse is very beautiful and many of your birds exotic to me... Never heard about Black Skimmers! The parakeet pictures remind me my mom's guava tree. My mom had a guava tree, and parakeets would come to eat guavas. If they didn't get tasty guava, they would rolled their eye, and would shout in such a tone you would feel that they had been quarreling with the owner of the tree. I always remember those funny gestures of the parakeets. Oh my! Those parakeets and the black skimmers, especially -- wonderful captures! Lucky you to be parked right in front of the parakeet tree! Such a beautiful place, lots to see and do. This post made me into the mood for vacation. Your photos of beach-scape is awesome with wild life, sea waves, and the stylish black and white lighthouse.. Blue-crowned parakeets are new to me, look social and playful. Thank you for sharing. Happy week! Great to see a lifer. Gorgeous seaside scenes and lighthouse. I was would to see a Skimmer myself. Wonderful views! Love the lighthouse mosaic! Nice snap of the black and white birds at the beach. I've never seen blue-crowned parakeets before. They look like small parrots. They're so handsome and green. We used to have a yellow parakeet living with. Loved that guy a lot. Cheers, Eileen. the parakeets are sensational...how cool to see them in a natural habitat!! beautiful capture of the gulls and skimmers...and the lighthouse is very pretty!!! Love those parakeets! Years ago when I lived in Sarasota, we had parakeets in our yard every day. They made a lot of noise! The parakeets and skimmers are fantastic - so unlike the birds we see here. Love it! Wonderful photos from your trip to Florida. The parakeets are really great. Lovely shots of the parakeets and skimmers.Florida looks a lot like Queensland. Great shot . Please check out my blog post. this is really great. Beautiful pictures and especially of the Black Skimmers. I only know these birds from the internet. So cool that you came across the beach. Really pretty.